A veteran of the Normandy landings on D-Day who went on to become editor of a regional daily newspaper has celebrated his 100th birthday. Tony Pyatt edited the Ipswich Evening Star for 13 years as part of a regional press career in which he also reported on the 1936 abdication crisis. He was made a Chevalier of the Order of Légion d’Honneur for helping to liberate France, and made an emotional return on the 70th anniversary of the landings two years ago with his sons to see the D-Day area now. 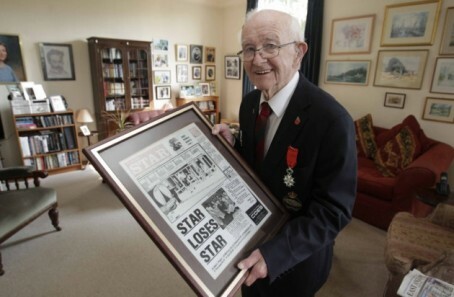 Tony, who was editor of the Star between 1965 and his retirement in 1978, spoke to his old newspaper after reaching his centenary on Friday. He said: “It was a very busy time and one of enormous change for the company and newspapers. In 1966 we expanded and moved our offices from Carr Street to Lower Brook Street where we installed the very latest high-speed printing press. “I remember the Green ‘Un was the last paper we printed at Carr Street after 80 years in the building. “We moved over the weekend and printed the East Anglian Daily Times as usual on Monday morning – service to our readers was not interrupted at all. Tony was born in Kent and partially brought up in East Anglia, beginning his career as an indentured apprentice on the Wisbech Standard in 1933. He later moved to the Surrey Weekly Press and Surrey County Herald, where he covered the abdication of King Edward VIII. He joined the Territorial Army in 1939 and two weeks later with the outbreak of war was called up to the 48th Royal Tank Regiment, initially as a trooper and rising to the rank of lieutenant and tank commander. In June 1944, Tony left for D-Day from the Port of London, as a signals officer in charge of communications for the regiment, landing with thousands of other British soldiers to secure the beachhead on Gold Beach. He said: “We had some hairy battles in the landing area, Arromanches, Caen and Bayeux. I was with the regiment all the time as we moved through Europe and Germany to Berlin, where I spent my last six months in the Army before being demobbed. After returning from war, Tony worked as a reporter and sub-editor at the Exeter Express & Echo before spending seven years subbing on the Star. He later had two spells each on the Birmingham Post and at the Standard Triumph Motor Co, where he edited a monthly tabloid newspaper for its 10,000 employees, before taking up the Star’s editorship. In his retirement he also served in a voluntary capacity as regional secretary of the National Council for the Training of Journalists, for which he also ran subbing courses and worked with trainee journalists at universities.